Fundrise investors have asked one question more than any other over the past year: When will Fundrise release a mobile app? Today, we’re thrilled to announce that the Fundrise iPhone app is now available for download in the App Store. As requested, Fundrise investors will now have the ability to monitor and manage their investments from their iPhone. We believe this represents a major step forward in our work to build the best real estate investing experience ever. What Does the Fundrise iPhone App Offer? 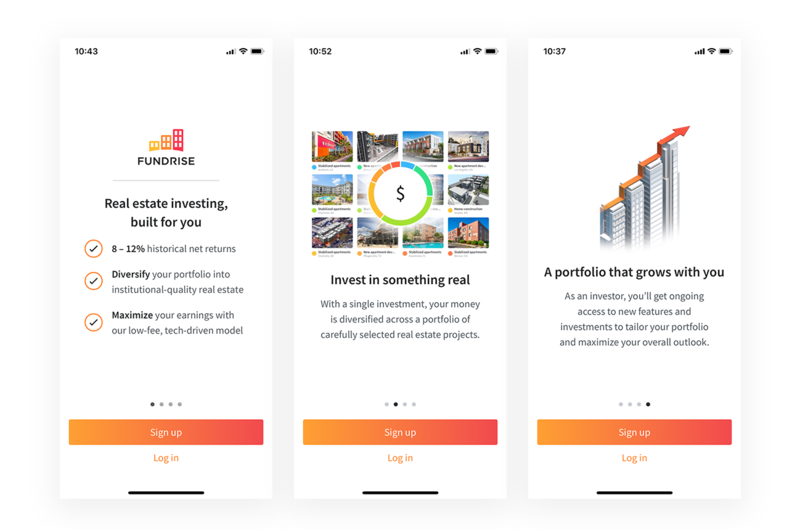 The Fundrise iPhone app is designed to bring the full suite of features available on the desktop experience to your fingertips — from monitoring your portfolio’s performance, to reviewing your investment allocation, to growing your account balance. Security is imperative in the financial services world, which is why we offer several layers of protection for our users. For all Fundrise experiences, we encrypt investor information with an AES bit symmetric key – the same level used by the largest commercial banks — and encourage investors to take advantage of the option to enable two-factor authentication. Email and password combination: The same email and password that you use to log onto Fundrise from anywhere else. It’s important to choose a password that’s unique to your Fundrise account in order to prevent the possibility of account hacking. Email and pin combination: Users have the option to enable a four-digit pin number for their login to simplify the login process. If you choose to use a pin, it’s important to pick one that’s unique to your Fundrise account. Touch ID: The Fundrise iPhone app supports Apple Touch ID login capability, which enables users to set app logins to require fingerprint verification. FaceID: Apple Face ID, which restricts access using face recognition technology, can also be enabled for account logins. One major difference between the desktop and mobile app experiences is the ability for mobile users to receive real-time alerts about their Fundrise account. Push notifications may include updates like dividends sent, confirmation of account transactions, asset updates, and announcements of new features and products. This way you’re never out of the loop on the status of your portfolio. The Fundrise iPhone app gives investors an easily-digestible view of the key metrics driving their portfolio’s performance, all in real-time. Part of our mission is setting a new standard of transparency in the investment industry, which includes being forthright with investment performance as well as fees. That’s why you will immediately see the yearly and all-time performance of your Fundrise investment portfolio upon login. You can view a breakdown of your investments’ performances across both distributed dividends and appreciation, and view net returns after accounting for advisory fees. Below the performance section of your home screen, you can find the newsfeed, which provides up-to-date information on major developments within your account. View every update in your account as you would on the desktop experience in the order that they’ve occurred in your account. You can scroll through this section to find updates including asset reports, letters to our investors, notices of dividends received, and tax document releases. In the second tab of the app, you’ll find two sections – Projects and Positions – that you can toggle between to view your investment portfolio in greater granularity. In the Positions section, you can view your portfolio’s allocation across each offering that you’ve invested in, down to the percentage of portfolio composition. You can tap any of the individual offerings to find out more about it, including the impact it’s made on your earnings across dividends and appreciation, as well as any fees paid for it. Under the Projects section, you can view the individual investments that comprise your Fundrise investment portfolio broken down by our color-coded risk rating system. You can tap on any color to view your collection of assets that fall under that risk rating. You can also tap on any individual asset to learn more about it, from location to investment structure to projected return. In the third tab, you can access the most comprehensive filtering capability to view the performance of your portfolio overall and the individual offerings that comprise it. You can view investment performance by year and all-time for each offering contained in your portfolio as well as the time-weighted performance of your investment portfolio as a whole. Return figures are available in both dollars and as a percentage in each view in this section. With the Fundrise app, you can access your account’s full activity history since its creation. By tapping the menu in the top left corner, you can view a detailed record of your transactions, including contributions, dividends sent, distributions, and reinvestments under the Transactions section. Under the Documents section, you have the same access to all account documents as you would on the desktop experience. Here you can view tax documents, account statements, and investment documents. Now you can easily update your account from anywhere on your phone using the Fundrise app. Do you want to upgrade your account service level, add funds manually, or update your auto-invest settings? Now you can easily manage these settings and more. You have as much control over your account settings in our app as you do on the desktop experience. If you aren’t a Fundrise investor yet, you can still create an account and learn more about Fundrise and explore investment options. Browse service levels and investment plans with a few taps to learn which might fit your diversification needs and investment goals. Using the app to sign up usually takes less than five minutes, and Fundrise integrates with more than 3,500 banks to make your investment experience seamless and convenient from the start. The Fundrise iPhone app is now available to download for free in the Apple app store. You can also learn more about Fundrise and explore our investment options on our website. We’re continuously working to improve our investor experience, and we hope our new app will do just that. As always, we welcome any feedback that you may have about the app or any other part of the Fundrise platform. Please feel free to reach out to us at investments@fundrise.com with any comments or questions.